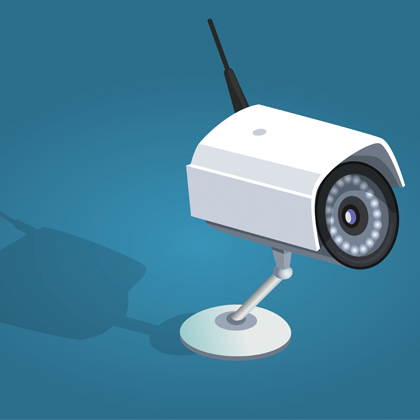 Wireless security cameras are rapidly becoming more sophisticated with the latest models now equipped with motion detection sensors and the ability to record footage of an intruder. More advanced cameras include facial recognition and two-way audio. But regardless of the model, it is the quality of the video footage that is the most important aspect of a wireless security camera. All security cameras support at least 720p resolution (1,280 x 720 pixels), although this is now giving way to 1080p (1,920 x 1,080 pixels). The ability to switch seamlessly between day and night modes and pick out the same level of detail even in low light is a pre-requisite for any good wireless security camera. Night vision enabled devices may use either: LED lights, infrared, or a combination of the two. Cameras with motion detection sensors usually have the ability to send alerts to a phone app or via email. It is also possible to set up a schedule whereby motion alerts are enabled only when the customer is out of the home. Cameras can either operate from the mains plug or from a battery. The obvious advantage of having a battery-powered device is that it is easier to position than one that just works off the mains. Facial recognition is a relatively new feature among today’s wireless security cameras although a ‘Which’ survey finds it can still be a bit ‘hit and miss’. The feature is supposed to recognise the various family members and set up alerts if unauthorised persons have gained entry to the home. In January, the Hong Kong based developer and manufacturer of security products and camera solutions, Reolink Digital Technology Co. Ltd, showcased its new product range at ‘CES 2019’ in Las Vegas. The offerings include the second generation Reolink Keen series, featuring a 100% wireless battery-powered weatherproof ‘pan and tilt’ Wi-Fi security camera. Solar panel charging is available as well as PIR sensor and 2-way audio. Reolink also rolled out its Argus 2 and Argus Pro as well as Reolink Go, with a 100% cordless mobile 4G LTE security camera with battery and solar powered operation. Also at CES, the smart home security company Ring unveiled a total of 13 new products, including its new Door View Cam. This works like Ring’s previous doorbell cameras, but instead of replacing the doorbell, it replaces the front door’s peephole. It is completely wire-free thanks to a battery that sits on the inside of the door. The new peephole camera offers motion detection and streams 1080p video straight to phone via the Ring app. What sets it apart from previous models is a built-in impact sensor that can automatically detect when someone knocks on the door. Ring says that the Door View Cam will be available in the US and UK, as well as a few other European countries later this year. However, there are fears that some models could pose a security risk to the home owner. In April 2018, a report was published by the Kaspersky Lab into the security of the Samsung SmartCam SNH-P-6410 smart home security camera. The lab described the camera, which is compatible with the Samsung SmartThings Hub, as being “riddled with bugs”. This follows on from a discovery in August 2016 of command injection vulnerabilities. And it is in addition to other problems Pen Test Partners (PTP), the high-end penetration testers and cyber security experts, has found with the Samsung-branded device. PTP also claims to have discovered security flaws with Swann and FLIR-FX/Lorex security cameras. The Swann battery powered HD security camera streams video either directly over the local network or via a cloud service. It promises its customers “Peace of mind from every angle” and features 1080p HD video plus a wide 120° viewing angle day and night. The camera’s 10-60 second video clips can be saved to the camera’s built-in back-up. The camera responds to voice commands from Amazon Alexa’s device. Push notifications can be sent together with video clips and audio to the customer’s smartphone. The Swann ‘security’ issue involved its cloud service provider OzVision and is now thought to have been resolved. PTP, however, is unaware if the issue with the Lorex device, which FLIR sold to Dahua in February 2018, has now been resolved. But despite these issues, which most observers see as teething problems to be resolved, the onward march of the wireless security camera looks set to continue and they will soon become part and parcel of the everyday home along with other internet of things (IoT) enabled devices. Household items such as light bulbs, fridges and thermostats are becoming internet-connected and this is allowing for the control of wireless security cameras via a smart home hub. In total, over 26 billion connected devices including cameras are predicted to be installed globally this year.